Warehouse Storage Solutions have supplied many customers in Warrington, Widnes & Runcorn with bespoke pallet racking solutions over the last 30 years. We know that all businesses are unique and one size fits all solutions are not always the best and most cost effective solutions. We offer customers bespoke pallet racking in Warrington Widnes & Runcorn that enable them to make the best use of the space on offer. The Warehouse Storage Solutions sales engineers operate nationally from our base in Yorkshire so only a short journey across the Pennines away. In many cases it is far more cost effective to have a bespoke pallet racking solution than when compared to costs involved in relocation or expansion of existing premises. Our specialist team always seek to ensure you get the best and most cost effective pallet racking solution for your business. More good reasons to choose Warehouse Storage Solutions for pallet racking in Warrington? We can deal with projects of all sizes from small single unit installations to complete distribution centres kit out. We are proud of the fact that most of our new work comes as a result of referrals from exiting satisfied customers. A wide range of pallet racking options. Our innovative pallet racking solutions are designed entirely to fit around your specific requirements. 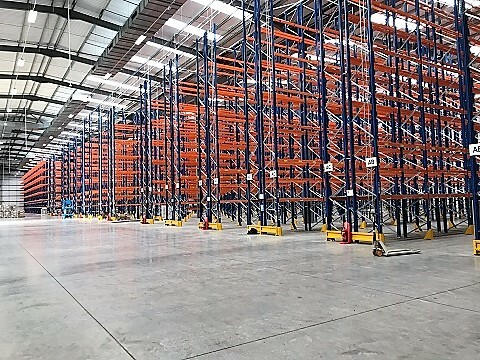 By far and away the UK’s most common type of pallet racking in the UK, versatile strong and can be built as multiple differing construction configurations. Its wide aisles allow easy access for people and fork lift operators. For those needing bulk storage then push back pallet racking may be your best option. Loaded onto rails this then pushes the other pallets back up to a maximum depth of 6 pallets. Double the depth of the pallets and quite simply you double your storage capacity. You need to use specialist handling equipment such as trucks with telescopic arms, most clients find this a really cost effective alternative. Distribution of high volume or fast moving goods or products where stock rotation is critical then live pallet Racking solutions are the correct solution. Pallets are on rollers which are slightly inclined allowing gravity to move the pallets through the system. For dense storage this option works well. It requires specialist handling equipment and maximises the amount of goods you can store. Fork lift trucks enter the storage lane making the most out of both the floor space and available height. Outdoor storage such as garden centres, chemical storage or steel stock holders. Designed for the UK ! the actual Pallet racking is manufactured and then undergoes a galvanising process to make it weather proof. You may be needing some help in considering a move or what to do in order to get the best out of your existing storage space, relocate, extend or re configure?